This desk provides a powerful workspace for optimal productivity. Its broad desk top and "L" shape supports space for multiple projects. The desk is made to accommodate the return on its left or right side, allowing for two "L" configurations. There is plenty of room for placing things like lamps or computers while still leaving ample workspace. The desk top also features two holes for cords as well as a two plug outlet. 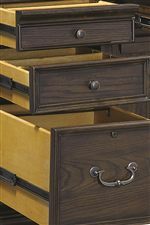 Five drawers and a large cupboard serve to suit storage and filing needs. 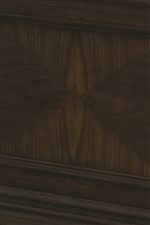 Elegant paneling detail on the front and sides of this desk give it a professional feel that will meld excellently into any traditional office scheme. The Essex Desk and Reversible Return with 5 Drawers by Aspenhome from Bullard Furniture. We proudly serve the Fayetteville, NC area. Product availability may vary. Contact us for the most current availability on this product. 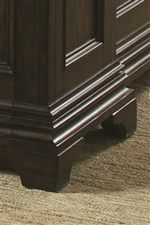 I24-307-1 Desk for Return 1 66" 35" 31"
I24-308-1 L/R Return 1 52" 19" 31"
The Essex collection is a great option if you are looking for Traditional furniture in the Fayetteville, NC area.